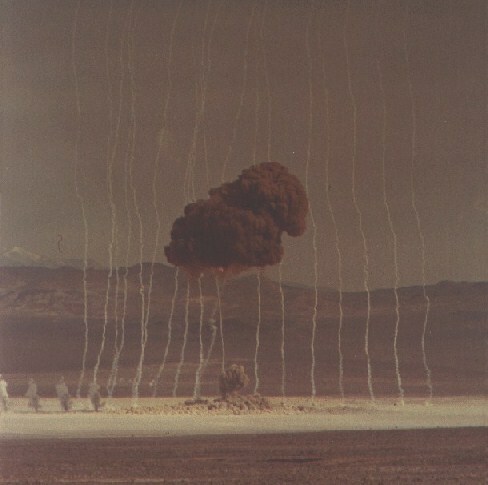 As the Korean War raged, the high tempo of Cold-War nuclear weapons tests continued with a second combined test operation being conducted at the Nevada Proving Ground (later NTS) scarcely four months after the last joint operation (Buster-Jangle). Operations at the NPG were beginning to resemble non-stop testing. With the U.S. preoccupied by Korea, and by the possibility of a general asian land war erupting, both parts of Tumbler-Snapper were focused on developing tactical nuclear weapons - both the weapons themselves and the knowledge and experience necessary for their operational use. 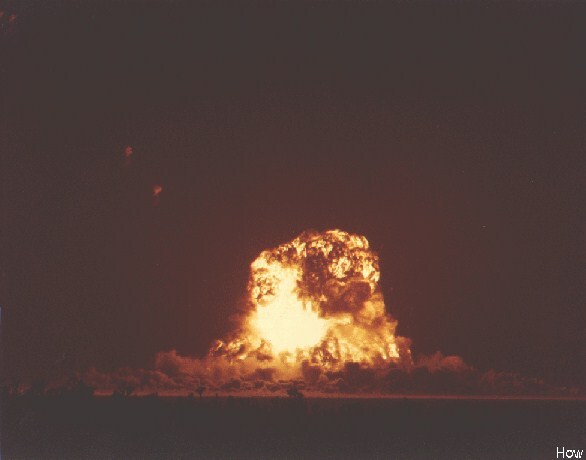 Operation Tumbler consisted of three air bursts conducted to gather detailed information about blast effects, the fourth test was also an airburst and technically part of both Tumbler and Snapper. The remaining four shots during Operation Snapper were tower shots and were weapons development tests of various kinds. The Desert Rock IV field exercise was conducted during Tumbler-Snapper, with 7350 out of 8700 DOD participants conducting maneuvers in conjunction with test shots Charlie, Dog, and George, and observing during Fox. Although the radiation exposure dose limit was set at 3.0 rem a number of exposures in excess of that occurred - 48 with 3-5 rem, 9 with 5-10 rem, and 1 in excess of 10 rem (these exposures do not cause observable health effects, but do cause a small increase in cancer risk). Tumber-Snapper released about 15,500 kilocuries of radioiodine (I-131) into the atmosphere (for comparison, Trinity released about 3200 kilocuries of radioiodine). Although this was only some 40% more than that released by Buster-Jangle, unfavorable weather patterns caused dramatically higher civilian radiation exposures (about 15-fold). The total thyroid tissue exposure amounted to 110 million person-rads, about 29% of all exposure due to continental nuclear tests. This can be expected to eventually cause about 34,000 cases of thyroid cancer, leading to some 1750 deaths. Chart of fallout exposures from "underground tests". From National Cancer Institute Study Estimating Thyroid Doses of I-131 Received by Americans From Nevada Atmospheric Nuclear Bomb Test, 1997. Go to the National Cancer Institute for detailed info. 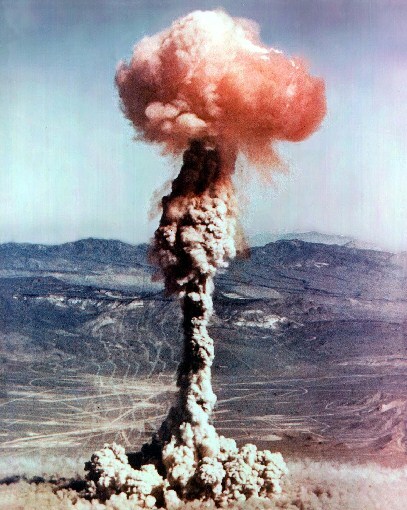 Previous test series (Sandstone, Greenhouse, and Buster) had revealed unexpected anomalies in blast over pressures and arrival times from airbursts, so Tumbler was conducted to gather detailed data on these effects. The first two tests were both 1 kt for convenience in developing scaling laws. All three air drops during Tumbler were from a B-50, which was a re-engined B-29. 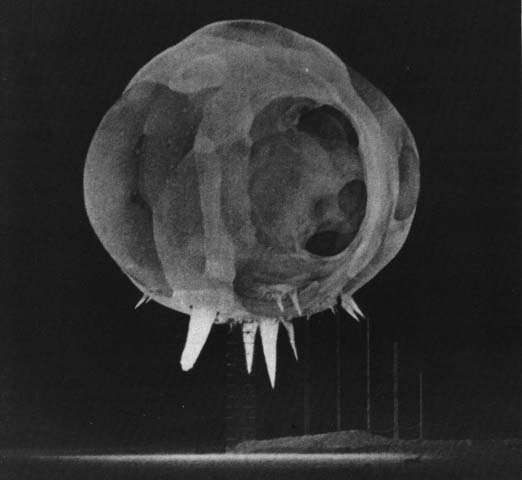 The test devices were all based on the large (60 inch diameter) heavy Mk 4 bomb, which was essentially the same size as the original Fat Man bomb, but with special core assemblies to obtain specific yields. This device used the same U-235 core design first tested in Ranger Able. This design had become something of an experimental benchmark due to its convenient low yield and high predictability, having also been used in Jangle Sugar and Jangle Uncle. The Mk 4 based test device weighed 10,800 lb. What are Those Smoke Trails Doing in That Test Picture? This device also used the Ranger Able U-235 core in a Mk 4 based test device (weight 10,500 lb). This test combined a proof test of a new high-efficiency core with blast effects measurements. The predicted yield was 40-60 kt. This test was broadcast live on television (a first). The Mk 4 based test device weighed 10,440 lb. This was an ambitious series to evaluate new weapon design principles and gather fundamental weapon design data. Among the new features tested included deuterium gas fusion boosting, external initiation, and the use of beryllium neutron reflector/tampers. Tests of new smaller implosion systems, and new schemes for achieving high core compression were also conducted. Other experiments calibrated the TOM internal neutron initiator, provided initiation time vs yield calibration data, and explored the curious "rope trick" effect seen with cable moored test devices. Dog was a test of a modified TX-7 weapon (previously tested in Buster Easy). The device tested the usefulness of deuterium gas fusion boosting (not deuterium-tritium boosting!). The predicted yield was 15-20 kt. This device (code named BROK-1) was a test of the TX-12, a Mk-12 bomb prototype. The Mk-12 was intended to be a slender, lightweight tactical bomb that could be carried externally by high speed fighter-bombers. It set a record at the time for small diameter and light weight, with an implosion system diameter of 22 inches weighing only 550 lb (a modest improvement over the Mk-7), yet retained good compression and efficiency. The total device weight was 625 lb, with a predicted yield of 9 kt. This device (code named XR1) used a Mk 5 bomb assembly. The test was intended to gather data on the initiation time vs yield curve; it also served as a calibration test of the TOM polonium-beryllium internal neutron initiator. 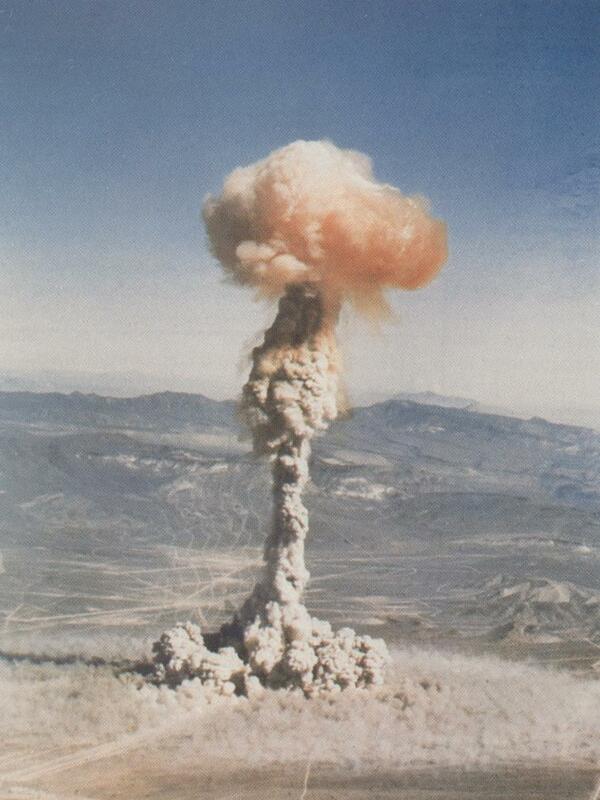 The test device had a diameter of 40 inches and weighed 2700 lb, the predicted yield was 15-18 kt. This device (code named XR2) used a Mk 5 bomb assembly. The test was intended to gather additional data on the initiation time vs yield curve. A novel feature of this test was the use of an external initiator - in this case employing a device called a betatron (which is a circular electron accelerator). In this test the high energy electrons were used to generate high energy X-rays that induced photo-fission in the core to initiate the chain reaction. The betatron allowed very accurate control of initiation time. The test device had a diameter of 40 inches and weighed 2700 lb, the predicted yield was 30 kt. This device (code named Scorpion) was designed in part by Ted Taylor. Snapper How was the first test to use a beryllium neutron reflector/tamper, which would become standard in later weapons. The test device used the same 22 inch implosion system as Snapper Easy, but the lightweight tamper cut 80 pounds off the implosion system weight. Predicted yield was 11 kt. The image below shows the growing fireball, taken about one millisecond after detonation, for one of the Snapper tower shots (I haven't been able to find out which one yet). There are two striking features about this picture - the spikes projecting from the bottom of the fireball, and the ghostly mottling of the fireball surface. The peculiar spikes are extensions of the fireball surface along ropes or cables that stretch from the shot cab (the housing for the test device at the top of the tower) to the ground. This novel phenomenon was named a "rope trick" by Dr. John Malik who investigated it. The effect had been observed in earlier tests when spikes were seen extending along cables that moored the shot towers to the ground. During Snapper Malik conducted experiments using different kinds of cables and ropes, and with different surface treatments. Consequently the spikes in this picture may be due to either mooring cables, or Malik's own test ropes. The cause of the "rope trick" is the absorption of thermal radiation from the fireball by the rope. 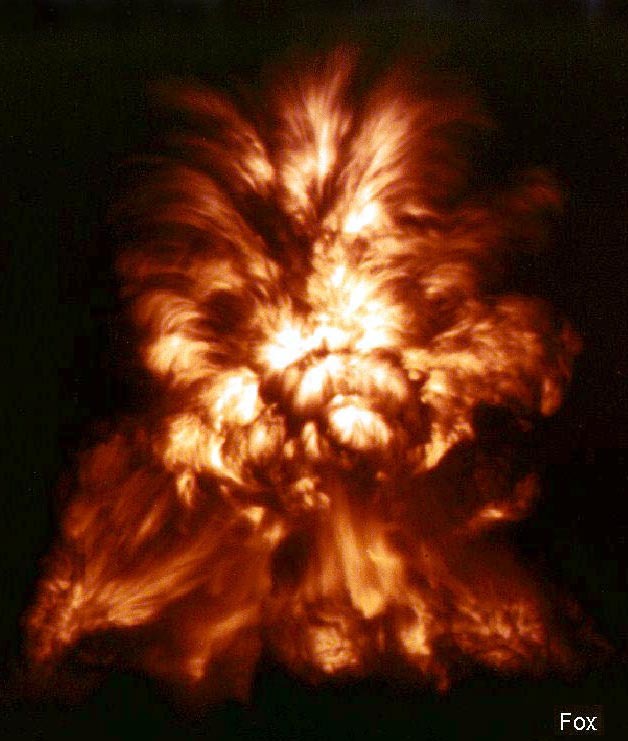 The fireball is still extremely hot (surface temperature around 20,000 degrees K at this point, some three and a half times hotter than the surface of the sun; at the center it may be more than ten times hotter) and radiates a tremendous amount of energy as visible light (intensity over 100 times greater than the sun) to which air is (surprise!) completely transparent. The rope is not transparent however, and the section of rope extending from the fireball surface gets rapidly heated to very high temperatures. The luminous vaporized rope rapidly expands and forms a spike-shaped extension of the fireball. Malik observed that if the rope was painted black spike formation was enhanced, and if it was painted with reflective paint or wrapped in aluminum foil no spikes were observed. Cause of the surface mottling. At this point in the explosion, a true hydrodynamic shock front has just formed. Prior to this moment the growth of the fireball was due to radiative transport, i.e. thermal x-rays outran the expanding bomb debris. Now however the fireball expansion is caused by the shock front driven by hydrodynamic pressure (as in a conventional explosion, only far more intense). The glowing surface of the fireball is due to shock compression heating of the air. This means that the fireball is now growing far more slowly than before. 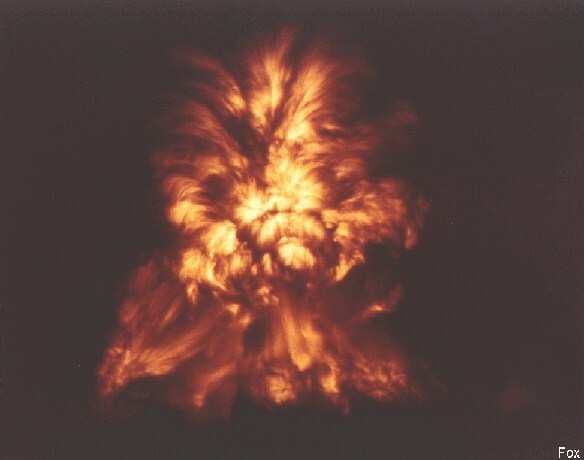 The bomb (and shot cab) vapors were initially accelerated to very high velocities (several tens of kilometers/sec) and clumps of this material are now splashing against the back of the shock front in an irregular pattern (due to initial variations in mass distribution around the bomb core), creating the curious mottled appearance. The photograph was shot by a Rapatronic camera built by EG&G. Since each camera could record only one exposure on a sheet of film, banks of four to 10 cameras were set up to take sequences of photographs. The average exposure time was three millionths of a second. The cameras were last used at the Test Site in 1962.